In winter 2006 the Watershed Center started a large project to reduce runoff pollution and eroding stream banks along Kids Creek in downtown Traverse City. This $116,000 project was funded through the Michigan DEQ Nonpoint Source Pollution Program and is in partnership with the City of Traverse City and the Grand Traverse Conservation District. Runoff is a primary concern throughout the Kids Creek subwatershed because of the resulting changes to hydrologic flow and the potential to contribute to excessive sediment, nutrient, and toxins to the Bay and its watershed. Due to a high amount of impervious, or paved, surfaces, the City of Traverse City generates large amounts of runoff when it rains and when snow melts. More than 40 percent of surfaces in the downtown area are paved. City officials consider runoff to be a high priority issue. Kids Creek experiences severe changes in flow, called flashiness, due to runoff during storms. 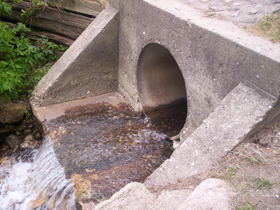 This causes regular flooding upstream of several culverts within the city limits. This flashiness has scoured stream bottoms and increased sedimentation from eroding stream banks within the stream, which further leads to a lack of suitable habitat for aquatic life. This is one of the main reasons that Kids Creek is on the state impaired waters list and is said to be in “nonattainment” for state water quality standards due to a lack of macroinvertebrates, which are small insects (See Section 4.1 and 5.3 of Grand Traverse Bay Watershed Protection Plan).